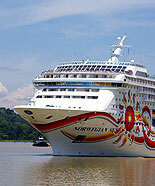 The Queen Victoria Cruise Ship in the Panama Canal January 20, 2010. 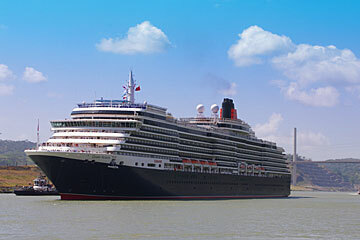 The Queen Victoria is of the same basic design as other Vista class passenger vessels, though slightly longer and more in keeping with Cunard's interior style. At 90,000 gross tons, she is the second largest Cunard ship ever built, after the RMS Queen Mary 2. The QV's facilities include seven restaurants, thirteen bars, three swimming pools, a ballroom, and a theatre. 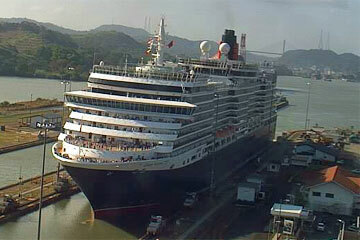 Here the Queen Victoria is shown on her South Bound Panama Canal Transit on January 20 2010. The Queen Victoria's exterior design closely resembles Vista class ships built for Holland America Line and P&O Cruises, like the MS Oosterdam, with a wrap-around promenade deck, private balconies, and a retractable glass magrodome over the mid-ship pool. 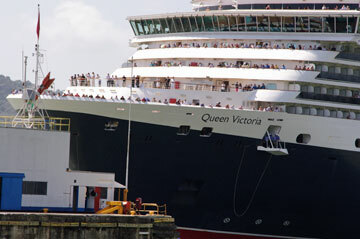 A feature which will distinguish her from her new sister, MS Queen Elizabeth is her more angled sloping stern, as compared to the newer ships vertical one. This is the first Cunard Line ship built by Fincantieri, one of the most technically advanced shipbuilders in the world who have built more than 7,000 vessels.